Process safety management seeks to establish a multi-level system to assess, document, maintain, and inspect equipment and work practices integral in controlling highly toxic and/or reactive materials. In a highly engineered environment, any variance can set off a chain of events that increases the probability of a process safety incident as violent as an explosion. Human behavior is often the biggest source of this variance, but it can also be the biggest asset for process safety management. Process industries are looking to understand sources of behavioral variance and build better processes based on sound behavioral science. Because of this clear link between behavior and process safety performance, the behavior science community has been challenged to research the behavioral root causes leading to variation that threaten process safety; create and evaluate behavioral interventions to mitigate this variation; and identify the system factors that would influence the behaviors necessary to promote process safety. 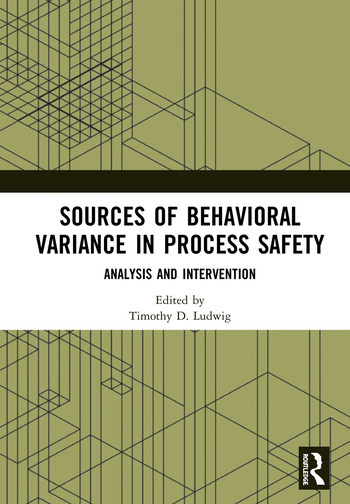 This book seeks to translate behavior analysis into practical systems that can help reduce human suffering from catastrophic process safety events. All of the chapters in this book were originally published in the Journal of Organizational Behavior Management. Timothy D. Ludwig is a Distinguished Graduate Professor at Appalachian State University, USA, and serves on the Cambridge Center for Behavioral Studies’ Commission that accredits best-in-industry safety programs. He is the author of dozens of scholarly articles and books that empirically document methods to improve safety and quality in industry through behavior analysis.